We have made our mark as Manufacturer, Supplier and Exporter of AISI-SUS 201 Stainless Steel Seamless Pipes & Tubes in Mumbai, Maharashtra. They are extensively used in boiler, ecomizers, super-heaters, pre-heaters and many others. The Stainless Steel Seamless Pipes & Tubes that we make available are designed using top-drawer Stainless Steel that is resistant to corrosion as well as abrasion. 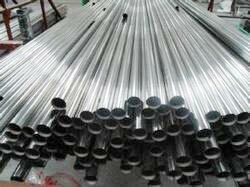 Our SS Pipes & Tubes are provided at rock bottom prices.